Private coach hire has been the mainstay of our business for over 55 years. With our large fleet of modern luxury coaches, Snowdon Coaches provides a safe, comfortable and environmentally-friendly vehicle to suit your every need. Our coaches and friendly, professional drivers are available for private, business and contract hire to any destination, for any duration, whether you are travelling for business or pleasure. 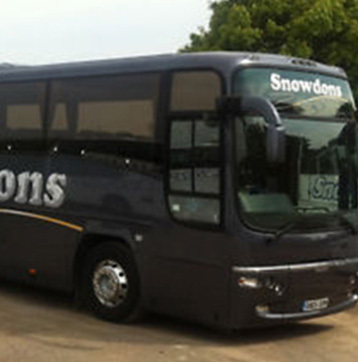 Snowdon Coaches' clients include private individuals and families, sports and social clubs, youth groups, schools and commercial companies. So whatever you're planning, you can relax in the knowledge that your coach hire arrangements are in the best possible hands. Whatever your needs, we can help! You may fancy a day at the races or a theme park, a trip for your club members, perhaps to a historic house or palace, a sightseeing trip or even a day out shopping! You may need to get to and from the airport or cruise terminal for your holiday, your wedding party may need to be transported on the big day or you want to get your hen night off to a great start and have all the travel arrangements sorted. Perhaps you are looking to arrange transportation for a team building exercise or trying to organise a corporate day out. Whatever the occasion, business or pleasure, you can relax in the knowledge that your coach hire arrangements are in good hands. Ideal for day trips, wedding parties, hen nights, educational visits, sports fixtures – you name it! © 2019 Snowdon Coaches All rights reserved.